I'm getting bored because I hadn't get Ar Tonelico 2 yet because the arrival in my country is delayed. Only few people can enjoy that instead me. In this moment I lost my blog pagerank because I rarely update this blog. In fact I need it for getting a review job and earn money from that. So sad, right? Actually I want to talk about cosplay again, because I like it. If there's no topics about Ar Tonelico game, then let's try about its cosplay character. When I googling about to searching a cosplayer who wear Ar Tonelico's costume, I hadn't see anyone that cosplaying Ar Tonelico. Looks like its rarely to find. But don't worry, I found them, they are none other my friends. Who they are? You'll know soon. 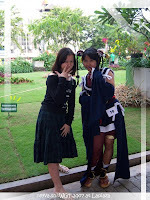 She is my friend who loving about Gundam Seed Destiny so badly, even she consider Athrun Zala as her husband :D. She wearing Misha's costume when she was attending in Battle of Harajuku. In my opinion, she was the one in the word who created and wore Misha's costume because I never seen anyone else do the same. In the next cosplay event, she have plan to make anoother Misha's costume like China Dress, Khansa (armored Misha), Shinobi, and little Misha. For china dress, she want to wear it when she attending some event such as "kondangan". This is her pictures, If you want to see, you will realize how beautiful she is. Ringirl is a little cosplayer girl, she still graduated in Senior high School, but I like to regard her as a primary schoolgirl (anak SD) because she has baby-faced. She will crying loudly if I keep treated her like a child. But However she have some Ar Tonelico costume like Luca Trulywaath and Aurica Nestmille in beta version . As you like, her style like a boiled scrab . Becareful, don't treat her like that or you'll get bited by her. Oh, she also have Jakuri's costume. Still in progress or what. This song for me is very good and gentle, sounds majestic. Sung by Misha (Hymmnos voiced by Akiko Shikata) to prevent Mir awaken from her long sleep. Misha sacrificing herself by singing forever under the Crescent Chronicle, where Mir was sealed. In Ar Tonelico, this song has an important role in the way of the story, especially in Phase 2 for Misha Path. However I love this song so much, even this song is the slogan of this blog. If you notice the contents, it similar with a lullably song. Of course you get it. You getting sleepy when you hear this song in the midnight. 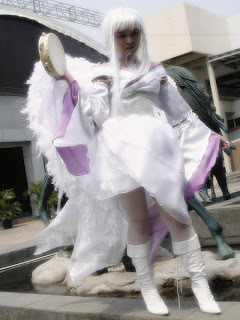 Angelic costume cosplay is the one of Ayr's costume collection. It's belong to original categories. 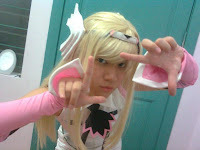 She had created it herself, inspired by anime and game characters. The processing time to make this about 2 weeks. The ingredients of this costume are twinkle, satin, organdy, and other cloth with purple color. For accessories, she use tamborin, wings, and some ribbons. It all cost about $50 or 500.000 IDR. But the result so excellent. This is an unique wings in heart-shaped. Constructed with steel wire in order to firmed then covered by white feathers. She put organdy for extension of the wings. For obi, she used two layers, silver cloth with net-shaped. That's good combination of the costume. White boots.